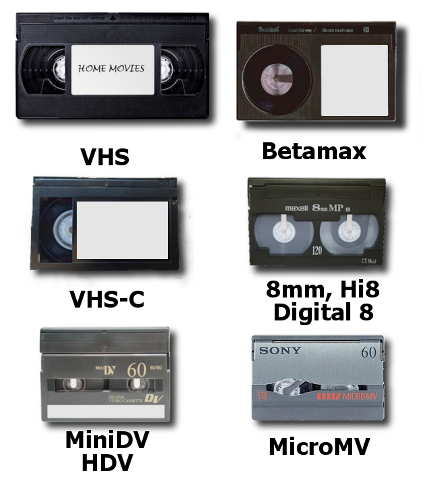 Conversion of your video tapes to DVD for the following types of tapes: VHS, VHS-C, BetaMax, MiniDV, HDV, MicroMV, 8mm, Hi8, and Digital 8 camcorder tapes. We can transfer PAL and SECAM tapes, too. Average turnaround of your order is two (2) weeks from receipt into our lab back to your doorstep. Pricing: Price is $25 / tape. Quantity discounts available. PAL tapes carry a $10 per tape upcharge. Video tapes longer than 2 hours in length require an extra master DVD for each additonal 2 hours of content - priced at $16.50 for each extra DVD required to finish the transfer. As an example, a four hour VHS tape transferred to DVD will cost $41.50 ($25 plus $16.50) for the final 2 DVD set. Each video tape is played in the appropriate tape-deck, its contents digitally captured by specialized software, and then reformatted into a standard definition video DVD-R. The DVD-R contains MPEG-2 video and audio files; is manufactured by either JVC Taiyo Yuden or Falcon, and has an advertised shelf life of over 30 years if stored properly. The DVD is set up for auto-play with chapter points for every 20 minutes of video content. One DVD can contain up to 2 hours of video. Unless requested otherwise, we automatically combine multiple video tapes onto as few new discs as possible. One (1) customized table of contents menu is at beginning of DVD, an example being “Bryant Family Home Movies”. The table of contents has a motion icon for each video tape, and clicking on the icon takes the viewer to the corresponding chapter marker within the video content on the DVD. We use professional tape decks with composite, S-video, and IEEE 1394 connections, linked to video ingestion software systems, to provide high quality capture and intermediate file types before final formatting. We employ time based correction and sync hardware to maintain a good video and audio match. Unless specified, we combine content from multiple tapes onto as few discs as possible, giving each video tape its own chapter on the disc. The table of contents for the DVD has an on-screen title, along with motion icons for each video tape and corresponding chapter markers within the disc's video content. Return of original customer content and new formats via shipping providers; we save copy of DVD disc image for 90 days in company storage network for cases of lost disc, extra copies, or addition editing. Optional video editing - we can add onscreen titles, rearrange content, add voice-over narratives, subtitles, and other notes to the digitized tape content to help retain the value of the transferred content. Contact us for a custom quote. From Anonymous of Venice, Florida on 11/19/2018 . I was very pleased with the job that Cintrex AV did converting my old VHS tapes into DVDs. I would definitely recommended this company to someone wanting to preserve treasured memories. From Benny of Dallas, Texas on 5/22/2017 . Had a great experience. I was able to finally get some old tapes on a format I can watch now. The process was easy, and the quality of work was outstanding. From James Reilly of Suitland, Maryland on 3/17/2016 . This is my 4th or 5th time using Cintrex AV. This time was a MiniDV to DVD transfer. Very pleased. Cintrex has done all my tranfers in recent years: Broadcast to DVD, Hi-8 to DVD, and now MiniDV to DVD. Happy everytime. From Anonymous of Columbus, Indiana on 1/7/2015 . Cintrex was very helpful. I made a mistake in the ordering process and they were very happy/quick to get it changed. The time in which I received the videos back turned into DVDs was much shorter than I expected. Great service. From Anonymous of Williamsburg, Virginia on 9/29/2014 . Cintrex did a very good and timely transfer of 10 of my videocassette home movies (some earlier transferred from 8 millimeter film to video) into 5 dvds with handsome packaging. Very professional. Highly recommended!